If you were Hillary Clinton and you had committed crimes a first year prosecutor could get an indictment for, would you be on TV suggesting Trump should be indicted for colluding with Russia, the evil country you used to commit your crimes? Or, would you hunker down and enjoy the millions you got for selling 19% of our uranium to Russia? ($150 million) We are supposed to believe the Russians who donated these millions to the Clinton Foundation, the family’s little slush fund, woke up one day and decided it was their favorite charity? My advice, Ms. Clinton, go away and enjoy what you stole from my country because some day you may have some very big legal bills. Ask Paul Manafort. Here’s what she said on Colbert’s show. The debate over whether or not a sitting president can be indicted has intensified amid special counsel Robert Mueller’s ongoing investigation into possible ties between President Trump’s campaign and Russia. In a week where a woman comes forth and claims she was sexually assaulted 35 years ago and then dictates to a Senate Committee hearing the confirmation proceedings for a Supreme Court Justice, we have this. This is a joke. The head of the Clinton Crime Family, Hillary, being asked by a late night talk show host, who rips Trump every night, about Russian crime and a Trump indictment. 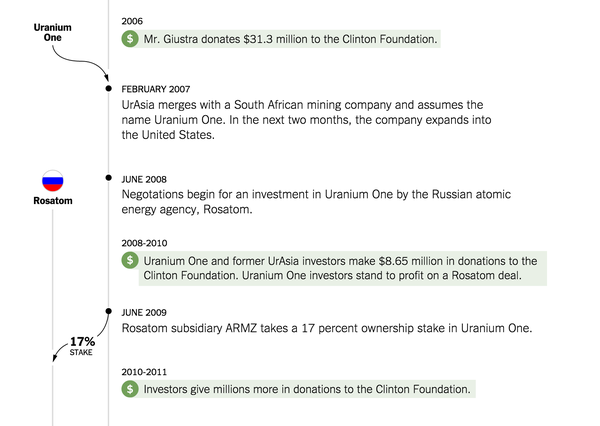 Let’s look at the Clinton relationship with Russia and Uranium One. By June 2009, a little over a year after the star-studded evening in Toronto, Uranium One’s stock was in free-fall, down 40 percent.